I will blog about my other love, toys! Animal toys are much easier to find than plant toys. Probably because lively animals seem more exciting as toy subject than sessile plants. It is most likely you could find dinosaurs, insects, mammals, frogs, lizards, fish toys than orchids, aroids, ferns etc. A kid might probably aspire to create a toy zoo than a toy garden. I think you get my drift that it is hard to find plant toys. But plant toys do exist but are harder to spot than the animal ones. I only have a few myself. The other day I was cleaning my old room and came across the very few left in my collection. Before I had a little more but regretfully gave them away as gifts. The first set are miniature handmade flowers in pots - made in Singapore. I bought them from a small shop in Ortigas which sadly is now closed. I used to have many of these, mostly orchids. I remembered having Phalaenopsis and Cattleya similes. Now what remains are 3 pots, a red orchid which I could not identify, a Paphiopedilum (slipper orchid) and a Nymphaea (water lily). The others are a set of plastic carnivorous plants, which I chanced upon a few years ago in a Japanese game arcade. These are capsule toys in bubble gum dispensers. I remembered shelling out about 2000 yen just to get 10 capsule toys. The complete set included 5 carnivore species but unfortunately I was not lucky to get the coveted Venus flytrap. Instead I got the four other pitcher plant species and duplicates (the doubles I also gave away as pasalubong to some friends). The most prized is the Nepenthes alata which is a Philippine native. I have free time right now. I will blog about how wonderful I found El Nido town in our March trip. We knew that the route to El Nido would entail a 5 hour trip from Puerto Princesa yet we still braved the very long and back breaking ride. After all, the raves about limestone islands were all superlatives like ' pictures could never give justice to the view' and ' as if you left the Philippines'. I had to see it with my own eyes. Once there, El Nido did not disappoint us. The sceneries were all breathtaking. Personally I was thinking the limestone mountains were just missing pagodas or temples to resemble a Chinese landscape painting. The karst limestone formations are very distinct in shape and pattern. The sharp ridges and slopes look so dangerous and precarious. There were even big loose rocks sitting and balancing atop other large outcrops. I learned about karst limestone formations when I was in graduate school. A lot of coastal areas in the Philippines are mostly karst, formed out of unpredictable limestone geography. The ridges and cliffs are the harder material with the softer areas eroded away by water. Sometimes in between the limestone geology, spaces and voids are created. That is why caves and caverns are common in limestone formations. In these caves, the swifts and swallows dwell and make their nests, which what made El Nido famous for. The Chinese prehistorically traded with the town for the swift nests to make the famed nido soup. Another note on karst geography, top soil is limited because most of the rock foundation is impenetrable limestone. Thus it is harder for trees to anchor themselves in limestone rock and the finite soil cover. There are lesser trees and plants adapted to karst limestone growth, particularly only the ones with roots which could get in the nooks and crannies of limestone rocks. Molave is one species adapted to such conditions, thus it is is common to see molave forests in coastal areas , rather than the forest dipterocarps (which have roots that grow straight and have to bore deep into the soil). Yet there are still some dipterocarps in the El Nido landscapes meaning it took them very long to anchor onto the limestone and establish themselves there. The fragile thing about El Nido is that if these forests are to be continuously ransacked for the dipterocarp lumber, it would be harder to reforest with dipterocarp species. I made a courtesy call on the local DENR office and learned from their forester that there are only about less than 50 percent original forest cover in the area. I do not know anything about the significance of statistics but what I heard is very alarming, just knowing that El Nido and the majority of Palawan geology is karst. What maybe a few minutes to cut and harvest will take decades and maybe centuries to bring back to its original state. And another thing is that the DENR nursery in Puerto Princesa is stocked with mostly exotics like gmelina, mahogany and auris. I am not sure what species they are growing in other town nurseries. It might not be long when the rest of the Palawan forest will be overran by introduced species, to the detriment of its well publicized biodiversity. When I visited the El Nido DENR office, I saw this beautiful Arenga palm by the office entrance. I was told it is an indigenous Palawan species. I saw this Arenga for the first time. This is one of the spectacular species in peril of being lost before becoming known to most Pinoys. We can only hope that this species never becomes a victim in the struggle for survival in Palawan forests. 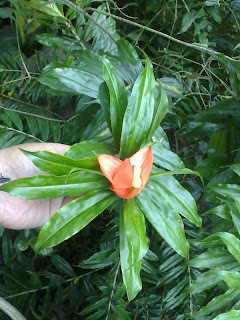 In my last trip to Calle Ruega, I spotted this plant growing along the path to the main chapel. It is ironically given the name 'stairway to heaven'. Well, it was appropriately positioned lining the walkway going to the romantic chapel where almost every bride nowadays would want to be wed. I wonder if the gardener who planted this knew that it is so called. The stairway-to-heaven, I was told, is actually a Philippine native plant called Freycinetia multiflora. It is a member of the pandan family. Freycinetias are collectively called climbing pandans because of their growth behavior, anchoring themselves on a tree or branch to reach higher ground and sunlight. Pandans are also known as screw pines as most have spiral leaf arrangement. This is also probably why they called F. multiflora 'stairway-to-heaven' because they resemble small spiral staircases. F. multiflora is becoming a fixture in most home gardens. It is already popular as a collection ornamental plant. It still has to be promoted more be mainstreamed as a landscape material. I have nothing against this plant. I just liked the sound of the word 'mayabang' with Medinilla. But the LLCo Garden's white medinilla is in full bloom. And to most urban gardens, the medinilla is not one of the favorites to flower in the metro. Yet this Medinilla specimen is heavily burdened with the purely white inflorescence spikes, which is not a very common sight in Metro Manila. I forgot the botanic name of this medinilla. Last year it was identified for us by Leonard himself but I did not write it down. If my memory serves me right the name is Medinilla teysmanii. Well, proud Medinilla teysmanii, if you are indeed a prolific urban bloomer, I predict you will be a common plant fixture in Philippine gardens in the future. Quickpost: Yesterday the Wildlife native flora demoplot was inaugurated and named after our friend and mentor, Leonard Co, the late great botanist. A small ceremony was prepared to honor and and also unveil the signage for th e garden. What was also memorable is that his family and friends became witness how it is possible to showcase some of our beautiful plants in one small area. And some of the specimens cooperated by exhibiting beautiful flowers. Incidentally the Visitor Center was also rededicated to Ninoy Aquino. The surrounding area was landscaped with vibrant exotic flowers. In my opinion, the natives can hold their own in comparison. The stereotypical image of carnivorous plants is the Venus flytrap in 'Little Shop of Horrors'. But most serious plant hobbyist would already know that 'plant carnivores' are far from that monster plant portrayed in the movie. They are never aggressive and most of the time their appetite only extends to insects and very minute animals. There are far more dangerous plants with potent poisons and toxins which should be feared more by people. But most plant collectors have avoided keeping these carnivorous plants mainly because they are harder to keep and maintain in a typical city garden. I particularly have tried to rear carnivorous plants, from the simple pitcher plant (Nepenthes spp.) to the much aspired Venus flytrap (Dionaea muscipula). I was successful in some occasions to emulate the very humid to almost bog-like environment needed to cultivate them. Once I already got one species of Nepenthes to even flower. But when the summer months came, these plants were one of the first plants to suffer in my dry full-sun garden. Now I have completely given up keeping any of these carnivores. But it is very much possible to keep some of the simpler pitcher plants in an urban garden. This afternoon I went to my friend Ronald's garden and saw his Nepenthes growing new pitchers. He has kept his plant on a driftwood with a lot of other epiphytes. The Nepenthes is benifitting from the humidity created from proximity to other plant species. In turn the plant developed new pitchers to trap insects and harness their animal protein. The Philippines has about a score of Nepenthes species and probably a few Droseras. The Philippine Native Plant Conservation Society came out with a limited run poster featuring Philippine pitcher plants. This was one of the last projects Leonard Co did as president of PNPCSI. This one is also from my backlog. A few months ago, members of the Philippine Native Plant Conservation Society were invited to go visit Reynold Sioson's farm in San Miguel, Bulacan. Rey is a native tree afficionado and has planted his family's property with native species which he has collected and propagated from his trips to different parts of the country. He calls his farm Cocomangas (I forgot to ask him why). The sprawling property is presently still largely open area and grassland, but certain portions he have already planted with native tree species seedlings. The seedlings are now a few feet tall but when and if they reach their full height potentials, Rey would have a forest in his backyard. Hopefully he could nurture these young trees and plant more indigenous trees. In one part of Cocomangas, there was a natural creek where water still flows and is retained. The banks of these wet area are still covered by the natural flora of Bulacan. Here you find remnants of the Bulacan vegetation like kamingi (Ixora philippinensis), balinawnaw (Lepisanthes fruticosa), salimbagat (Caparris micracantha), putat (Barringtonia racemosa) and some others. Rey makes sure that this area would stay the same and has propagated them to give away. A few of us members of PNPCSI has already benefitted from his generosity. We went home with bags of tree seedlings and a big smile in our faces. To Reynold Sioson, a long overdue gratitude for your hospitality. I still have the samuyaw seedling I owe you. I collect a lot of stuff but never stamps. I figured that this and coins would always be a never ending collection. When I was younger I got into coins and it continued on till maybe when I was in college. 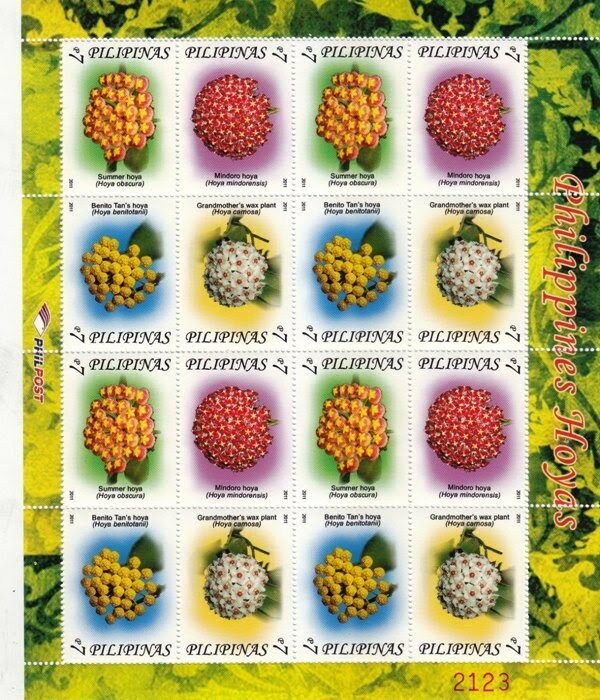 But I as far as I could remember I never really considered stamp collecting as a hobby I could go into. This afternoon though, I found myself making the trip to the Lawton post office. This was not my first time inside the Neo-Classic edifice. But it was the first time I went into their philatelic section. 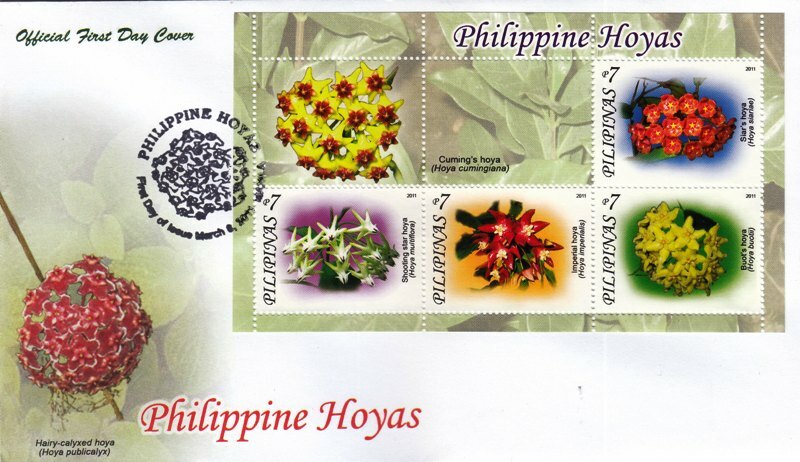 The reason: the Philippine Post Office finally issued stamps featuring Philippine hoyas. I used to seriously collect Hoyas to the point that I had about 50 to 60 varietes in my garden. Now they are reduced to handful of pots, as they have taken the back seat in my collection. Probably my most cherished hoya is the H. halconensis which was given to me by Nahdanielle Simonnson of Sweden which she collected from Mt. Halcon in 2006. My 2 pots which came from a pair of cuttings have produced numerous propagations which went to quite a number of Hoya collectors. Hoya may be gone physically from my garden but somehow it still holds a special place in my heart. So I decided to make that trip to the Lawton main post office to get me a set of the Hoya stamps. I do not know the basics of stamp collecting but I was given a crash course by Lawrence Chan, whom I have known because of hoyas. 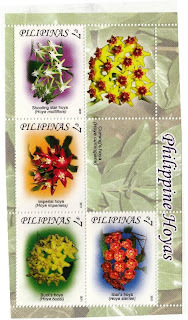 Lawrence, as far back in 2003 was pushing to have the Post Office issue Philippine hoya stamps. Finally his wish was granted, after about 8 years. And he was so happy to bring us the good news. It is also timely that they went out this year as more people are now aware of hoyas as a garden ornamental. 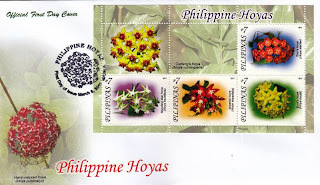 There are about 60 to 70 (and still counting) Hoya species native to the Philippines and only about 10 percent were included in the set. I bought 4 separate items. There were 2 kinds of stamp sheets issued. The regular edition spread included Hoyas obscura, mindorensis, benitotanii and carnosa. The collector's edition had Hoyas mutiflora, cumingiana, imperialis, siariae and buotii. 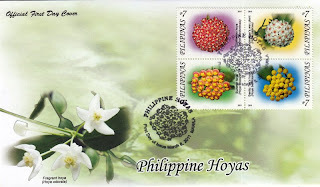 There were also the stamped first issue envelops (one for each edition) to commemorate the stamp's day of issue. The envelops also had printed pictures of Hoyas namely H. publicalyx and H. odorata. 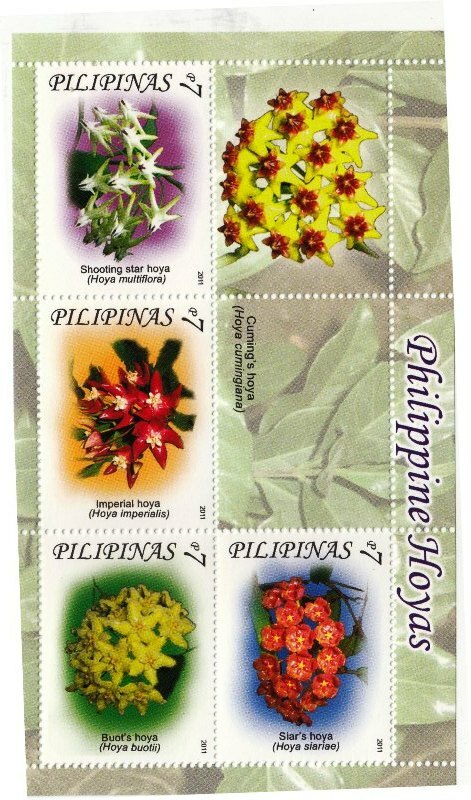 As any other, these Hoya stamps have a limited run meaning they are only available while supply last. So if you are a collector, stamps or hoya, you might want to go make the trip to Lawton and get your copy.